You…. Wake up every day. Eyes open, chest rising and falling. The thoughts, plans, lists and responsibilities start running through your mind. Your body resists the urge to move, stretch, get out bed. The lights come on, your eyes squint, your breathing patterns get shorter and you start your day. No matter what you do today, you are doing it. The hours pass, the stress levels rise and fall. Emotions come in waves throughout the day. Laughter, joy, calmness, annoyance, hunger, numbness, anger, stress, enjoyment, pride, success, grief, pain, sleepiness. It all affects your mind, your plans, your body. Night falls, your body rests in its place. Your breathing deepens, your day, events, ups and downs, they run through your mind and you try to clear your thoughts. Lights off, phones down, your eyes shut and your thoughts get muted by your desire to rest, you and take a break only to wake up tomorrow to do the same thing. What is this? What the hell are we doing? Auto pilot is a thing. And this ride called life that I have been a passenger on for 33 years is annoying. The fleeting moments of happiness that triumphed through the dark were moments that I still cling to because the majority of my life has been veiled in pain from these emotions that plague me. I had moments where I took the wheel as much as possible and made “big” changes in my so called daily life. That’s great and all, but where did it get me? To a new city, with a new job, new friends, new experiences, yay me, but still in this body – still breathing, moving, resting, feeling, living……. Without my consent. And I just have to deal with it. What the hell are we really doing here? Is it a game? Is it for entertainment? Is it a test? We have all heard of dozens of theories, religious insights, beliefs, hopes, patters, scientific evolution to try to explain our significance, but just as I prefer dark chocolate over milk chocolate and I think that we should all help our fellow humans no matter who they are or where we are in life, our ideas of why we are here and the direction of our moral compasses are just that, ideas…. Nothing more. They are and were created by the minds we can’t control or understand anyway. So, how do we accept these ideas as steadfast truths? Does anyone really believe any of it anyway? Isn’t everything relative? Or do they just hold onto the thought or belief of it as a form of solace and security to get through this strange stage of life as we know it? Non conformance to the belief system our society holds firm to doesn’t make us unique or wiser than the average bear…. But I choose to keep my eyes open and my mind flexible to different concepts, ideas and visions of what life is all about. At the same time, as much as I would like to figure it all out – I would also like to enjoy it – while I am here – because I don’t really have a choice or a say in where I am going after this or what happen to me later today…. All I have is this moment, and this moment is mine, and I will embrace it as is and will enjoy it as much as humanly possible. For a long while I have been aware that happiness is a state of mind. Your mind is something you can control – making happiness a conscious choice. Although our emotions can easily control our mind, our mind can also control our emotions. It is hard to find peace within ourselves in the midst of our busy lives. I get lost so easily in the lists of tasks that I need to fill every ounce of my spare time with. There have been so many times where I have lost sight of who I am and what I need because I have titled myself with what I do. But…. I am not what I do; where I work, where I shop, or what I have accomplished. None of those things describe me, yet so often I title who I am with those things…. I have been on a spiritual journey for the last decade or so. I have been desperately trying to figure out who I am. What I need. And what brings me peace; It has humbled me, it has had me on my knees begging for guidance, it has thrown me in situations I didn’t know how to get out of, some of them I feared getting out of at all, and they caused me to question absolutely every truth I thought I knew. On the other end of that spectrum it has brought me courage, a thirst for knowledge, unity within myself and with others and an unconditional acceptance of myself and the rest of humanity as one. It has also taught me what love truly is. Learning how to quiet my mind has been the biggest obstacle for me. But when I finally got it, I really got it. I can sit and zone out the world, I can listen to my soul and what the universe is saying to me as I breathe in my surroundings and breathe out the unrealistic expectations I have upon myself and reality. Understanding that the difference between reality and what I think reality should be has opened up an entire new world for me. The duality and cosmic balance that is always at battle within me gets turned off, or at least paused while I create an open space for my heart and soul to interact with my mind. No filters, no anxiety, no frustrations, no expectations, just quiet…. It has changed me. It has given me a place to go when the uncertainty of reality creeps in a little too strong. It gives me a place to go when I can’t answer questions about myself. I have an open book of answers to every question I have ever had and it is free and easily accessible whenever it is needed. All I have to do is take the time to read it. 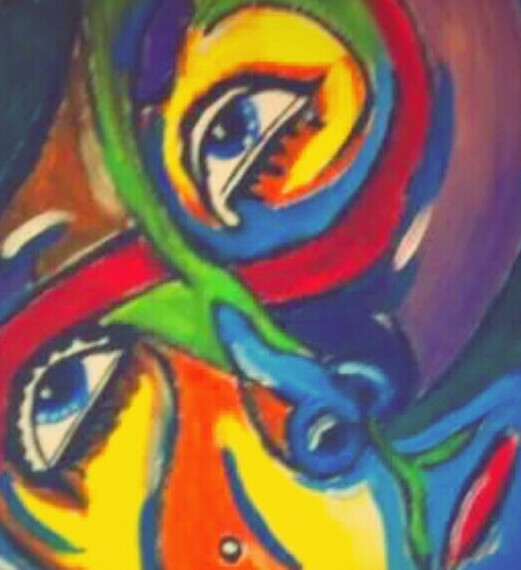 As an artist I love to express my inner-self with words and visual art, but I now have this new obstacle I’m struggling with when it comes to this amazing new discovery within myself that I can’t seem express enough. I want to share it with others, but I haven’t found the right way. I can’t find the words to express the complete and purest form of happy that I have ever felt within myself. I can’t find the colors to paint that picture. But what I can express is that your heaven resides within yourself and it is a journey worth sacrificing time for. I chose to be happy by taking action. I chose to shut out my insecurities and fears. And I have chosen to open my heart, mind and soul to knowledge I never knew existed. I can’t express the enormous amount of joy that it is bringing me. Choose to be happy, loves. Make it a conscious effort and find your path to peace. Close your eyes and listen to where your heart leads you. It is as simple as that. As we welcome the new year we all have the desire to set new goals, new starts, and new beginnings… Some of us take the time to reflect on the last year and measure our success compared to the goals we set at this very time one year ago. I love goals… I love short term goals that build to long term goals and I love achieving them more than anything else. I also hate disappointment, and I get frustrated when I can’t achieve a simple goal that I set in motion for myself. So, as it is with most things in life, it’s a love/hate relationship. I have materialist goals, career goals, educational goals, relationship goals, but most importantly I have these goals that support emotional and spiritual growth. These goals, to me, are the most important. I set the standard high for myself mostly because I have been witness to the power of intention and faith. I have been blessed with certain souls that have come into my life at just the right times and that have shared their knowledge and personal experiences with me. One in particular that has been my spiritual muse and counselor. Even if I haven’t met all the resolutions I wanted to meet this past year, I can confidently say that I am proud of who I have become and what I have evolved into. I’ve experienced a lot of ‘firsts’ and ‘lasts’ and I am grateful for each one. I have met and welcomed new people into my life and I have released certain people from the world I call my own, and I am blessed to have experienced all of it. The point to this blog is to push you and myself, alike, to be the best persons that we can be. To strive for more on a continuous basis but also to be grateful of every moment and experience that comes your way. To leave a lasting impression on this world and to make our journey here one that is beautiful and filled with love, inspiration, light and power. Take a few moments and reflect on who have become in the recent years, realize that everything you want in and out of life is within your grasp. Take a leap of faith, swallow your fear of failure, trust your instincts, and jump! Spread your wings and fly! Be strong and prosper on! Blaming anyone or anything for the things that transpire in your life is a sure way to slow any kind of healing or growing both emotionally and spiritually. BLAME gives you a reason to excuse yourself from the responsibility of the ups and downs of your life. Not everything that has happened to you or around you is within your control but your reaction to it is. BLAME is not the answer. It takes up space in your heart and soul. Space that could and should be used to practice acceptance, understanding, empathy and most importantly forgiveness. 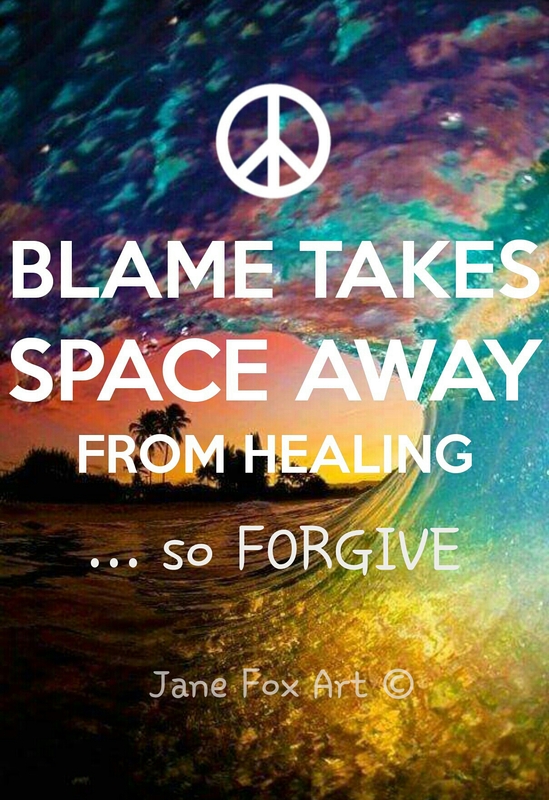 Peace comes when we let go of blame. When we let go of ego and pride. When we accept the past as part of our lives, not as who we are. This is how we heal. Make room for peace by letting go of the negative. Forgive. Accept. Learn. Grow. And love.